To implement an Insecticide Resistance Management (IRM) strategy through a randomized controlled trial (phase III), 28 villages were selected in southern Benin. No recent entomological data being available in these villages, entomological surveys were performed between October 2007 and May 2008, before vector control strategies implementation, to establish baseline data. Mosquitoes were sampled by human landing collection (16 person-nights per village per survey per village) during 5 surveys. Mosquitoes were identified morphologically and by molecular methods. The Plasmodium falciparum circumsporozoïte indexes were measured by ELISA, and the entomological inoculation rates (EIRs) were calculated. Molecular detection of pyrethroid knock down resistance (Kdr) and of insensitive acetylcholinesterase were performed. 44,693 mosquitoes belonging to 28 different species were caught from October 2007 to May 2008. Among mosquitoes caught, 318 were An. gambiae s.s., 2 were An. nili, 568 were An. funestus s.s., and one individual was An. leesoni. EIR was 2.05 ± 1.28 infective bites per human per 100 nights on average, of which 0.67 ± 0.60 were from An. funestus and 1.38 ± 0.94 infective bites were from An. gambiae. Important variations were noted between villages considering mosquito density and malaria transmission indicating a spatial heterogeneity in the study area. The kdr allelic frequency was 28.86% in An. gambiae s.s. on average and significantly increases from October 2007 (10.26%) to May 2008 (33.87%) in M molecular form of An. gambiae s.s. Ace 1 mutation was found in S molecular of An. gambiae s.s at a low frequency (< 1%). 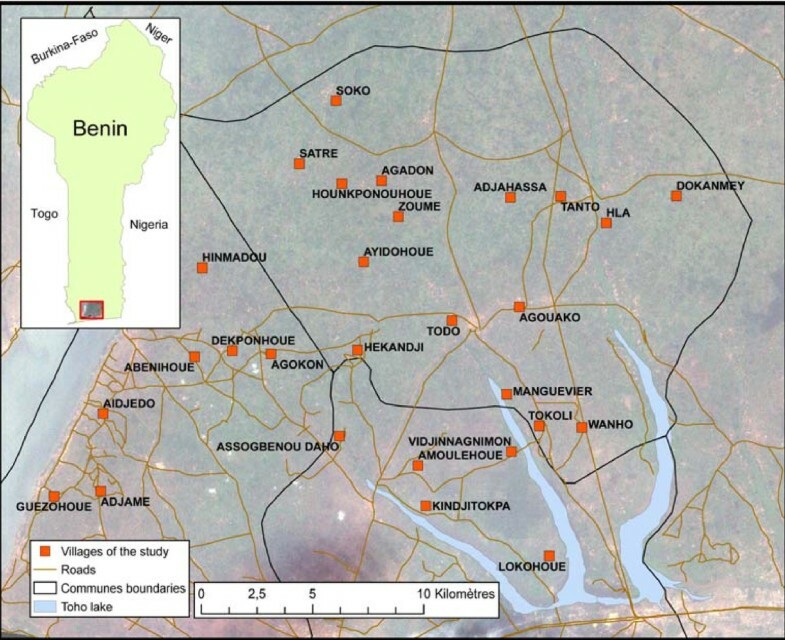 This study updates information on mosquito diversity and malaria risk in rural villages from south Benin. It showed a high spatial heterogeneity in mosquito distribution and malaria transmission and underlines the need of further investigations of biological, ecological, and behavioral traits of malaria vectors species and forms. This study is a necessary prerequisite to cartography malaria risk and to improve vector control operations in southern Benin. Malaria remains a major cause of morbidity and mortality in sub-Saharan Africa and represents one of the most critical public health challenges for Africa. In 2008, 243 million cases of malaria was estimated worldwide leading to 863 000 deaths of which 89% were in the African Region . Treatment with Artemisinin Combination Therapy (ACT), the use of Indoor Residual Spraying (IRS) and Insecticide Treated Nets (ITNs) represent the main approaches of malaria control . Household ITNs ownership reached more than 50% in several high burden African countries . Pyrethroids are the only insecticides used for net impregnation because of their strong efficacy, their fast acting effect at low doses and their low toxicity for mammals . Unfortunately, pyrethroids resistance in malaria vectors has spread across Africa and is now present in most of countries where national malaria control programmes (NMCP) are implementing large scale distribution of Long Lasting Nets to populations at risk, i.e. children under five and pregnant women . Up to now, there is no evidence that pyrethroids resistance reduce the effectiveness of ITNs for malaria control at operational scale . However, a small scale field trial carried out in an area of resistance in southern Benin (Ladji) and Burkina Faso (Kou Valley) showed a reduction of personal protection and overall insecticidal effect of ITNs in experimental huts [5–7]. It is then urgent to find ways to manage this resistance in malaria vectors. In this context, malaria vectors control and insecticide resistance management tools based on the use (alone or in combination with pyrethroid-treated mosquito nets) of alternative classes of insecticides with different mode of action than pyrethroids were developed and have already been evaluated in experimental huts, with good results against wild populations of strongly resistant An. gambiae[6, 7]. To validate these strategies, their impact on malaria transmission and insecticide resistance dynamic in malaria vectors must be accessed through randomized controlled trials under phase III. For that purpose, 28 villages were selected in Ouidah-Kpomasse-Tori (OKT) health district in southern Benin. No entomological data from OKT health district was available. Recent data relative to Culicidae fauna of Benin go back up to 1950s [8, 9]. Thus, in order to collect baseline data relative to mosquito's diversity and abundance, malaria transmission and the prevalence of insecticide resistance alleles in malaria vectors, entomological surveys were performed between October 2007 and May 2008 in the study area before implementing the vector control strategies. This paper reports these baseline data. The study was carried out in OKT health district. Twenty eight villages were selected considering a size between 250-500 inhabitants, a distance between two villages higher than two kilometers and the absence of a local health center. The OKT health district is one of 36 health districts in Benin. This district has essentially a sub-equatorial climate, with two dry seasons (August-September and December-March), and two rainy seasons (April-July and October-November). The average annual rainfall is around 1200 mm, of which 700-800 mm come in the first rainy season and 400-500 mm come in the second rainy season. The average monthly temperatures vary between 27 and 31°C. The northern part of the health district is made of a plateau that drops into the Couffo valley and the Allada depression. The southern is watered by several ramification arms of Toho Lake (Fig 1). The study zone is totally cleared of the original equatorial forest. Currently, the vegetation is characterized by bushes and isolated trees, associated with areas with more or less densely populated areas with oil palm trees. Sampling of mosquitoes was done in 28 villages by human landing catches using tubes that were plugged with cotton. Mosquitoes collection was carried out during 5 surveys from October 2007 to May 2008 (2 in the beginning of rainy periods and 3 in dry periods) every 6 weeks both indoors and outdoors at 4 sites per village from 10 p.m. to 6 a.m. and for two consecutive nights per survey (i.e. 16 person-nights per village per survey). Teams of collectors were rotated among the collection points on different collection nights to minimize sampling bias. Ethical clearance was given for the study by the National Ethical Committee in Benin (Comité National Provisoire d'Ethique pour la Recherche en Santé) and IRD ethical committee (Comité Consultatif de Déontologie et d'Ethique). Collectors gave prior informed consent and they were vaccinated against yellow fever. Since study was done in area where malaria is endemic, adult collectors that already acquired immunity against malaria parasites, did not received chemoprophylaxis, but were medically supervised by local physicians in case of illness. Mosquitoes were identified on the field to species level using morphological criteria according to the identification keys [10–12]. All mosquitoes belonging to the An. gambiae complex or An. funestus group were stored in individual tubes with silica gel and preserved at -20°C in the laboratory. Heads and thoraces of anopheline females were tested by Enzyme-Linked Immunosorbent Assay (ELISA) for detection of P. falciparum circumsporozoite protein (CSP), as previously described . Samples having an optical density higher than 3 times the average of the optical density of negative control were considered as positive. Those having an optical density between 2 and 3 times this average were considered as doubtful and were retested. The CSP index was calculated as the proportion of mosquitoes found to be positive for CSP. Entomological inoculation rates (EIRs) were estimated as the number of infective bites per human per 100 nights. All mosquitoes belonging to An. gambiae complex and Anopheles funestus group were identified by polymerase chain reaction (PCR) at the species levels [14, 15]. Molecular forms in Anopheles gambiae s.s. were also identified . Chi-square tests were done to determine the odds of association of the CSP index with malaria vectors An. gambiae and An. funestus. Villages were grouped according to their homogeneity for the entomological indicator considered taking into account ßi and its P value. In each group, the average of the number of mosquitoes caught per village per survey (or the number of infective bites per human per 100 nights) was calculated with its 95% confidence interval. The genotypic differentiation of kdr and Ace1 loci was tested using the Fischer exact test implemented in GenePop software . A total of 44,693 mosquitoes belonging to 28 species were caught (table 1). Mansonia Africana (44.84%), Culex gr. decens (29.91%), Culex quinquefasciatus (9.81%), and Culex nebulosis (6.22%) were the most abundant species caught. The proportion of malaria vectors (Anopheles gambiae and Anopheles funestus) was very low (~2%). All mosquitoes belonging to Anopheles gambiae s.l., were An. gambiae s.s. (217 from S molecular form and 101 from M form). Concerning Anopheles funestus group all mosquitoes were identified by PCR as Anopheles funestus s.s. except one individual which was An. leesoni, caught in Tokoli-Vidjinangnimon village. Large variations were observed between villages considering mosquito's density. An average of 212 ± 46 Culicidae per village per survey and 531 ± 139 Culicidae per village per survey were caught in two different homogenous villages groups (Table 2). Concerning An. gambiae s.l. on average 0.4 ± 0.2; 1.8 ± 0.6 and 7.4 ± 3.5 individuals were caught per village per survey in three different homogenous villages groups (Table 3). In villages close to a arm of the Toho Lake, 13.48 ± 5.9 An. funestus s.l. were caught on average per village per survey, in contrast with 0.29 ± 0.1 in the others villages (Table 4). The CSP positivity rate was 9.63 ± 3.2% in An. gambiae s.s. (5.94 ± 0.4% in M molecular form and 11.52 ± 0.2% in S form) and 2.64 ± 1.3% in An. funestus s.l.. An. gambiae s.s. was more infected than An. funestus s.l. (OR = 4.00 (95%IC 2.13-7.54), P < 0.001). The average of EIR from October 2007 to May 2008 was 2.05 ± 1.28 infective bites per human per 100 nights of which 0.67 ± 0.60 infective bites of An. funestus per human per 100 nights and 1.38 ± 0.94 infective bites of An. gambiae per human per 100 nights. EIR was very variable according to villages. Two homogenous villages groups with respectively 0.7 ± 0.4 and 6.1 ± 3.4 infective bites per human per 100 nights were observed (Table 5). Kdr resistance gene status in An. gambiae. The average of kdr allelic frequency from October 2007 to May 2008 was 28.86% in An. gambiae s.s. At the beginning of the study (From October to December 2007), kdr allelic frequency was significantly higher in S molecular form of An. gambiae s.s. (28.08%) compared to the M molecular form (10.26%) (P = 0.001). This allelic frequency significantly increased in the M molecular form and has reached 33.87% (P < 0.001) from January to May 2008 (Table 6). The allelic frequency of this gene was less than 1%. Only two heterozygous individuals was found in the S molecular form of An. gambiae s.s. at Tanto and Hekandji during October 2007. The present study provides entomological baseline data on OKT health district. Twenty eight different species were caught during surveys whereas Huttel (1950) and Hamon (1954) had collected respectively 13 species (adult's collection in the dwellings) and 45 species (adult and larval collection) in the south-east of Benin (Cotonou and Porto-Novo) [8, 9]. If the Culicidae diversity is lower in our study, we have identified 3 Anopheles species that was not mentioned in Hamon study: An. brohieri, An. coustani and An. nili. These 3 species were present at very low densities, explaining why they were not reported previously. More unexpected is the predominance in our study of Mansonia africana and the presence of Cx quinquefasciatus that were not reported by Hamon. The relative abundance of Cx. quinquefasciatus is particularly surprising for a species which is adapted to polluted larval breeding sites and usually more familiar with urban environment than traditional villages from this study. Results showed a high heterogeneity of the study area in terms of Culicidae and especially malaria vectors abundance. It could be due to the geographic pattern of this area that is characterized by a northern part made of a plateau and the southern watered by several ramification arms of Toho Lake. An. funestus density was higher in villages close to arms of Toho Lake (< 2 km), since some of its larval breeding sites are the bank of lake or river with vegetation. In most villages of the study area, the soil is made of a thick bed of a mixture of sand and clay allowing a rapid water infiltration after rain. This impedes the formation of An. gambiae larval breeding sites that could explain the low density of malaria vectors. However, on the 5 surveys conducted in each village, only two were conducted during a rainy period (in the beginning of the rainy periods). This could explain the very low number of anopheles vectors caught during the study. Further studies conducted on a long period and taking into account environmental factors are required to better understand mosquito's distribution determinants in this area. Anopheles gambiae s.s. and An. funestus s.s. were shown to be the main vectors in the study area, confirming previous studies in West Africa [20–22]. The relative abundance of An. funestus in the study area and its CSP positivity rate (2.64 ± 1.3) indicate that this mosquito is involved in malaria transmission in southern Benin. No data relative to resistance status and mechanisms of this vector being available in Benin, further studies about An. funestus populations and their resistance mechanisms are required. The EIR, 2.05 ± 1.28 infective bites per human per 100 nights on average, indicates that in the study area, malaria is mesoendemic. These data agree with parasitological and clinical data collected in the same way in these villages indicating an annual prevalence rate of 21.8% (19.1-24.4) in young asymptomatic children and a clinical incidence of Plasmodium falciparum malaria of 1.5 (1.2-1.9) per child per year (Damien et al. 2010, unpublished data). The kdr-w resistance allele was identified in An. gambiae populations examined in this study and have significantly increased from October 2007 to May 2008 in M molecular form in contrast with S form, indicating probably that M and S molecular forms of this vector undergo different selection pressures in the study area and underlines the need of further studies taking into account ecological and others factors. The presence of the kdr-w allele in An. gambiae s.s. and the increase of its frequency are worrying because this gene and metabolic resistance mechanisms in southern Benin appears to have a significant impact on LLIN efficacy as demonstrated by recent experimental hut trial . Many other studies have showed a strong decrease of Pyrethroid-Treated Nets performance against pyrethroid-resistant malaria vectors in Benin [5, 6], Burkina Faso , and Côte d'Ivoire . Regarding carbamate resistance, we confirmed the low allelic frequency of the ace-1 R allele (< 1%) in An. gambiae s.s. in West Africa , showing that there is no (or very low) selection pressure on this allele in the study area. However, a monitoring of this resistance gene is required considering the large scale implementation of Indoor Residual Spraying using bendiocarb by President's Malaria Initiative program in south Benin that will inevitably increase the selection pressure on vectors populations. This study updates information on mosquito's distribution and their role in malaria transmission in southern Benin. It showed a high spatial heterogeneity in mosquitoes distribution and malaria transmission and then underlines the need of further investigations of biological, ecological, and behavioral traits of malaria vectors species and forms. That will allow to cartography malaria risk and then to improve vector control interventions in Benin. We thank the Ministère Français des Affaires Etrangères for project REFS N° 2006-22 and the Institut de Recherche pour le Developpement, which financially and materially supported the work. We thank populations of the study area, OKT health district, for their collaboration. We also thank Seth Irish for his linguistic assistance while drafting this manuscript. FC and M-CH conceived of the study. AD, JC and FC have participated in the design of the study. Entomologic data was collected by AD, JC, RO, SK. AD, SK and RO carried laboratory analysis. AD, FC, OB and VC have participated in the analysis and interpretation of data. Maps were provided by SBB and NM. The manuscript has been drafted by AD. AD, SBB, NM, M-CH, OB, JC, RO, SK, VC, MA and FC have been involved in manuscript revising. All authors read and approved the final manuscript.